Anselm was born in Aosta, part of the Piedmont region of present-day Italy, around 1033. While his father provided little in the way of moral or religious influence, his mother was a notably devout woman and chose to send Anselm to a school run by the Benedictine order. The boy felt a profound religious calling during these years, spurred in part by a dream in which he met and conversed with God. His father, however, prevented him from becoming a monk at age 15. This disappointment was followed by a period of severe illness, as well as his mother's early death. Unable to join the monks, and tired of mistreatment by his father, Anselm left home and wandered throughout parts of France and Italy for three years. His life regained its direction in Normandy, where he met the Benedictine prior Lanfranc of Pavia and became his disciple. Lanfranc recognized his pupil's intellectual gifts and encouraged his vocation to religious life. 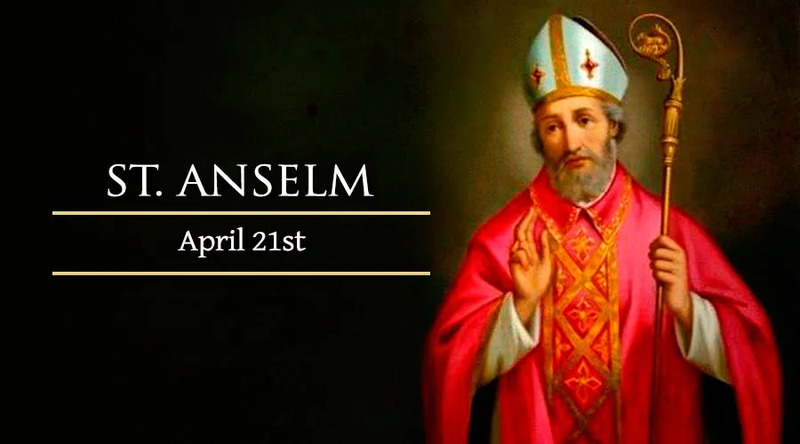 Accepted into the order and ordained a priest at age 27, Anselm succeeded his teacher as prior in1063 when Lanfranc was called to become abbot of another monastery. Anselm became abbot of his own monastery in1079. During the previous decade the Normans had conquered England, and they sought to bring monks from Normandy to influence the Church in the country. Lanfranc became Archbishop of Canterbury, and asked Anselm to come and assist him. The period after Lanfranc's death, in the late 1080s, was a difficult time for the English Church. As part of his general mistreatment of the Church, King William Rufus refused to allow the appointment of a new archbishop. Anselm had gone back to his monastery, and did not want to return to England. In 1092, however, he was persuaded to do so. The following year, the king changed his mind and allowed Anselm to become Archbishop of Canterbury. But the monk was extremely reluctant to accept the charge, which would involve him in further struggles with the English crown in subsequent years. For a three-year period in the early 12th century, Anselm's insistence on the self-government of the Church – against the claims of the state to its administration and property – caused him to be exiled from England. But he was successful in his struggle, and returned to his archdiocese in 1106. In his last years, Anselm worked to reform the Church and continued his theological investigations – following the motto of “faith seeking understanding.” After his death in 1109, his influence on the subsequent course of theology led Pope Clement XI to name him a Doctor of the Church in 1720.